Toshiba is a pioneer of the electronic age and coined the term "notebook" for the first time in 1989 for a mobile computer ("Dynabook"). 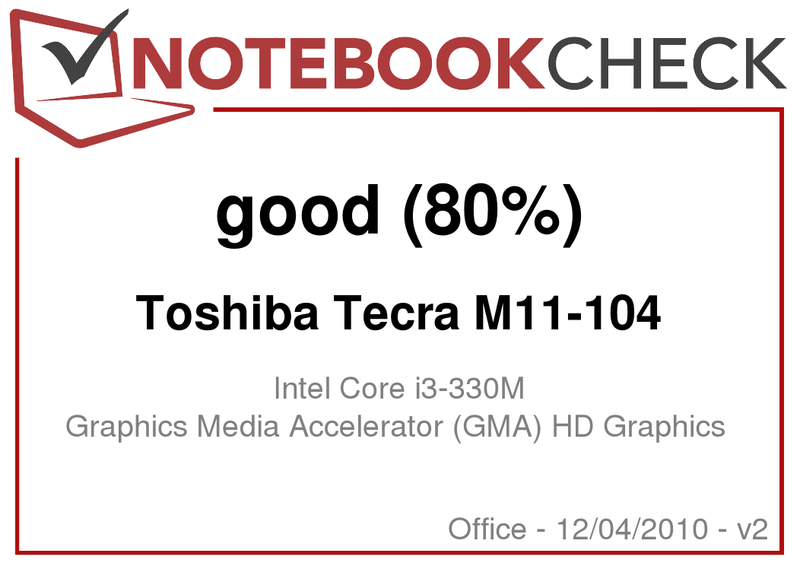 Thus, our expectations in a Toshiba notebook, after more than 20 years of experience in the field of mobile computing, are high. This time, the Tecra M11-104 has found its way onto the test bench. 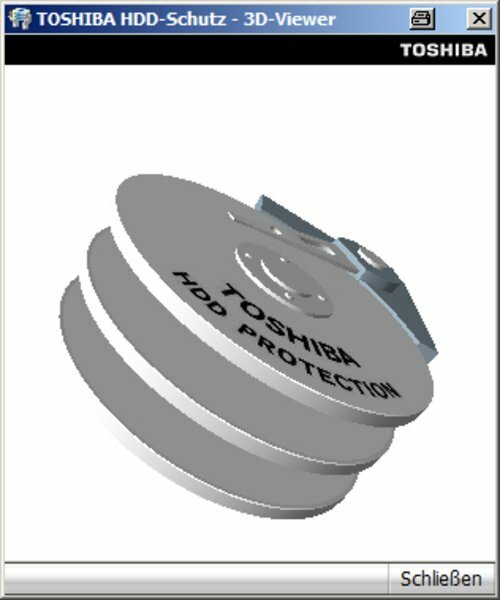 It's the smallest of Toshiba's "business range in a compact size". It's supposed to be a reliable companion for the mobile business day with its compact size and especially robust design. At the same time, it should offer the necessary security. And really, the M11 limits itself to the essentials for its intended job. 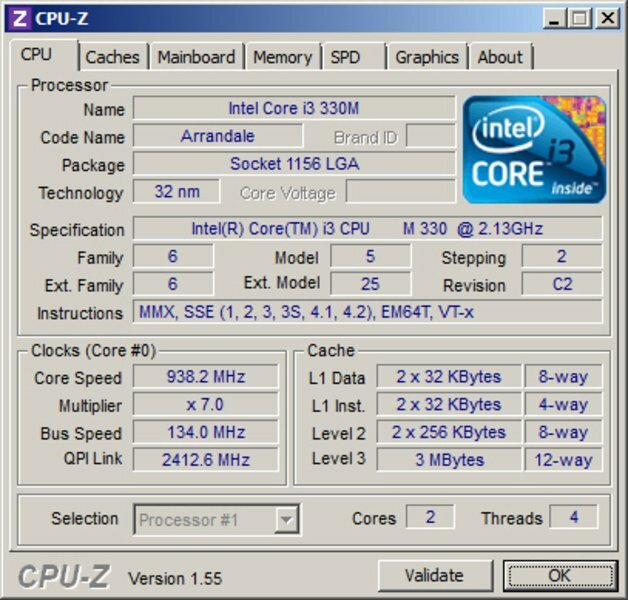 Aside from a Core i3-330M CPU (incl. HD graphics), 4 GB of RAM and a 250 GB hard disk, there aren't any breathtaking core components found inside the laptop. That's not necessary, anyway. The modern business man or business woman doesn't usually need pure computing power. Reliability, connectivity and durability are priority. You can get the M11-104's little brother with more CPU and GPU power. Besides that, they have a better connectivity for on the go thanks to UMTS. 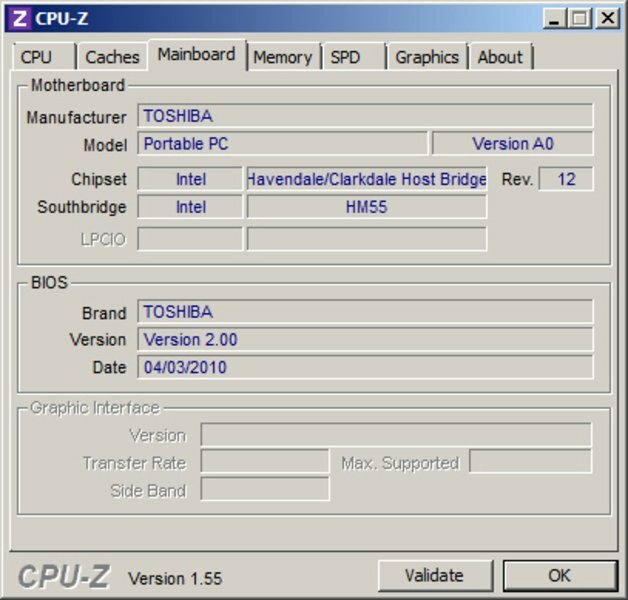 The fact that Toshiba does not make use of the Intel v-Pro platform could be a drawback. It was especially developed for business use and also has the necessary maintenance functions for larger IT assets, which the "standard" components don't. There is also the longer availability of spare parts. 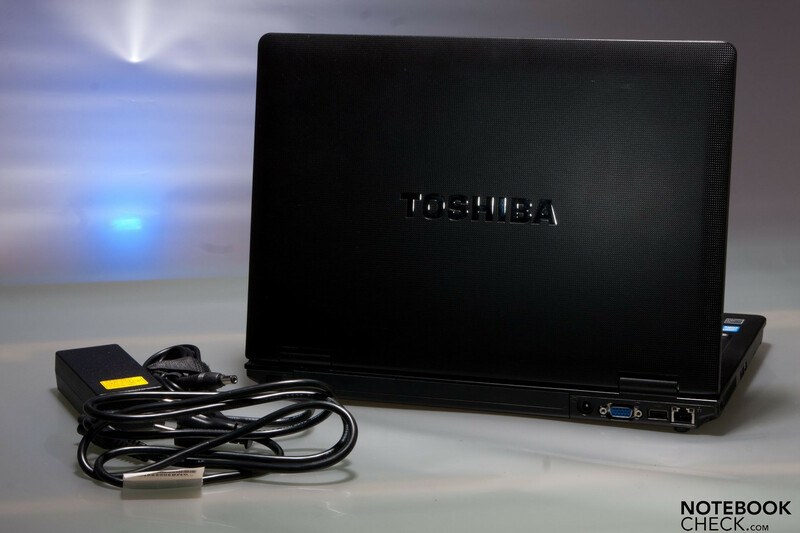 Toshiba tries to implement ergonomic requirements by using a bright and anti-glare 14 inch LED display, a well-sized keyboard and a docking station port. The resemblance of the M11 to a well-known representative of the business sector is instantly apparent. 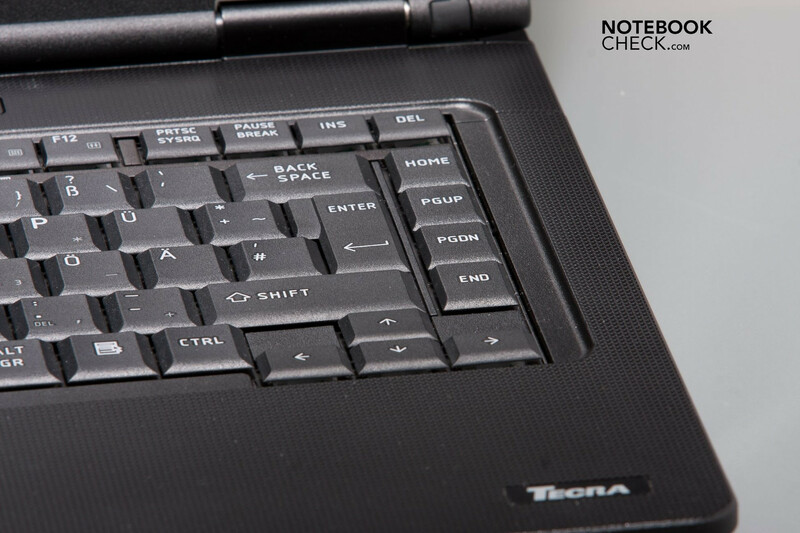 The Tecra series doesn't only seem to have an affinity for Lenovo's Thinkpad range. A few inner values are also identical. Therefore, we will compare the M11 to the Thinkpad L412 that we have reviewed in the relevant section. The notebook's dimensions of 349 mm width, 242 mm depth and 36.5 mm rear height (32.8 mm in the front) are within the usual range for a 14 inch notebook. "Panther black with a textured surface design" is the description found under the subtitle case color in the Tecra's specifications. That sounds spectacular, but is rather plain in reality. The surface structure proves to be resistant against stains left by greasy fingers. It has been applied to the entire notebook, with exception of the device's bottom and the inside display bezel. The fact that the M11 is completely black, with exception of the touchpad keys and the logo (chrome color) is absolutely striking. Even the keyboard presents itself in mourning dress. That may seem quite dull at first sight. But this case color has been found to be resistant to scratches. With the Tecra's exterior, it makes a solid first impression. We don't notice any deformation when we pick it up at the front. The plastic even defies our twisting tries. 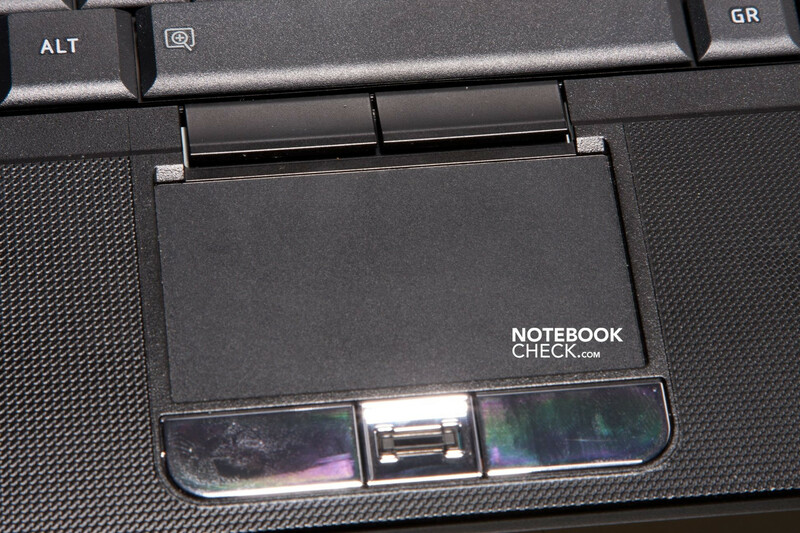 However, the more we press around on the notebook, the more typical weak points are noticed on the case. Over the keyboard, where the hotkeys are found, over the optical drive and the display lid's center. The latter stands out positively from other devices of the same category (e.g. Fujitsu S760), though. The display is fairly solid and rigid and even the hinges have enough resistance. If we press against the lower display edge, or against the display itself, a further manufacturing flaw becomes obvious. A gap of up to 5 mm is created between screen and case. Lenovo has done a better job with this. The display really fits tight in its frame. Moreover, both devices don't have a display latch. However, it's not tragical in the Thinkpad due to its clamshell design. That provides for a very good closure of the display to the base unit. But it could get really aggravating with the Tecra. For example when loose paperclips scratch the display, because there is a gap large enough for such objects to slip in. They could also slip into the installed cardreader without ado, as it doesn't have a cover. Thus, the contacts can grime very quickly and cards might not be read anymore. The Tecra M11-104 supplies a basic array of connections. Three USB 2.0 ports, one of which is a combined eSATA port, are given. Connecting a USB stick to this combo port requires both sensitivity as well as force. In any case, care is needed to not break something off the stick or port. The port's charging function is advantageous. The laptop doesn't have to be turned on for that. But caution: too excessive use of this function, when the notebook isn't connected to the mains, taxes the battery. All ports and interfaces are extremely close to each other. Thus, it will be difficult to find a fitting port on the notebook for the one or other USB stick (UMTS, memory, etc). A mini display port as a digital video out is rather unusual and rare on external LCD displays. It may supply a laptop projector with a suitable connection, but that's not always the case. Thus, there is only the VGA-out left for the presentation. There are adapters for the mini display port (display port, DVI, HDMI), but they are potential small parts that, according to Murphy's Law, disappear in the depths of laptop cases, when you need them urgently. The 34 mm ExpressCard slot bids numerous expansion options. However, some expansions require a 54 mm slot (e.g. chip card reader). 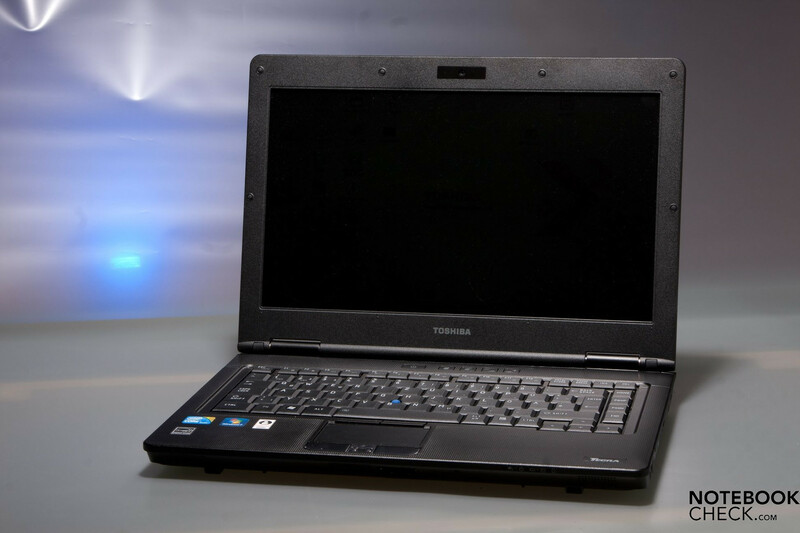 The Thinkpad L412 doesn't include such a reader, but its big brother from the T range does. The optionally available docking station has the meanwhile rare connection options "serial" and "parallel". There are still many devices that can only be addressed by such interfaces, particularly in the industrial field. The Tecra shows itself communicative with an HD webcam (720p) and built-in microphone. However, it is doubtful if such high-resolution data streams can be transmitted on the go. UMTS is first available in a superior configuration. 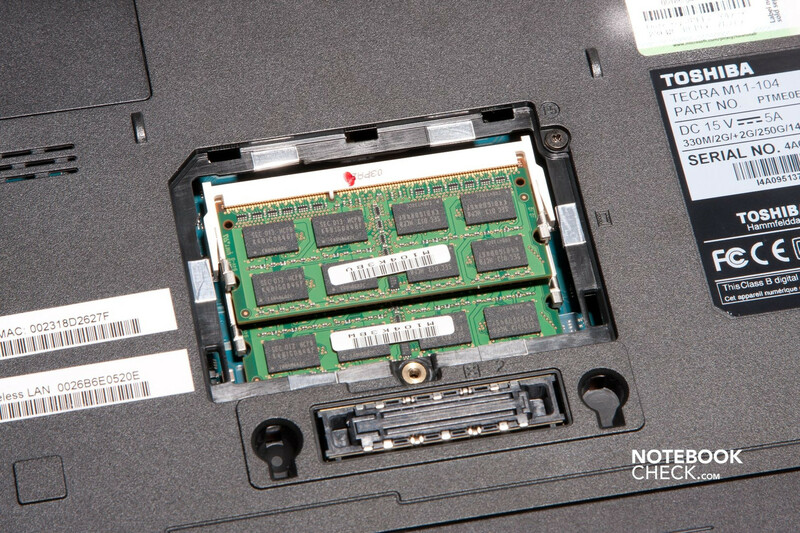 The hard disk sensor is supposed to provide special protection. 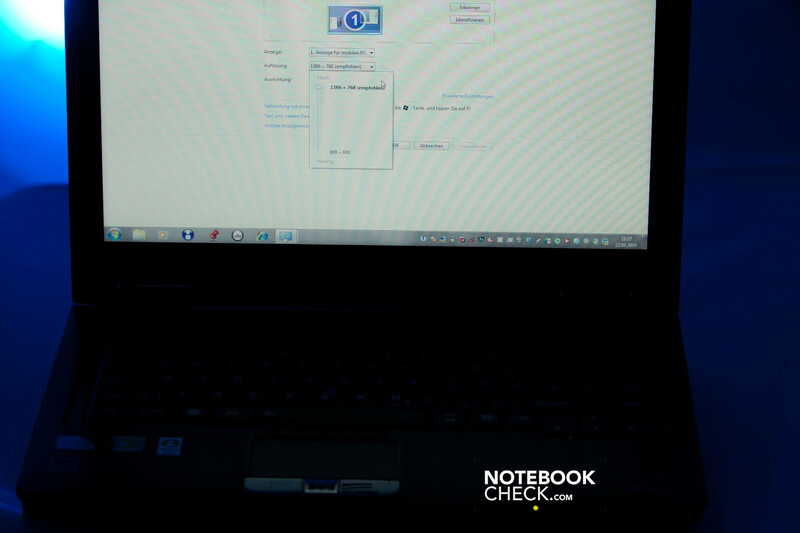 In addition to vibrations, it recognizes the laptop's hard disk position. This is supposed to reliably protect the hard disk against head crashes should the notebook fall down or too strong vibrations threaten the data in a train. 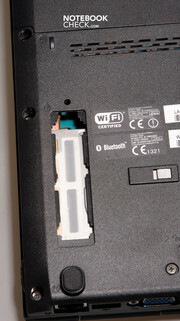 This technology has been developed in cooperation with IBM and is thus found in many devices of the Thinkpad range. A feasible and sensible feature that really belongs in every mobile device with a hard disk. It has even convinced Apple and is installed in the MacBooks. 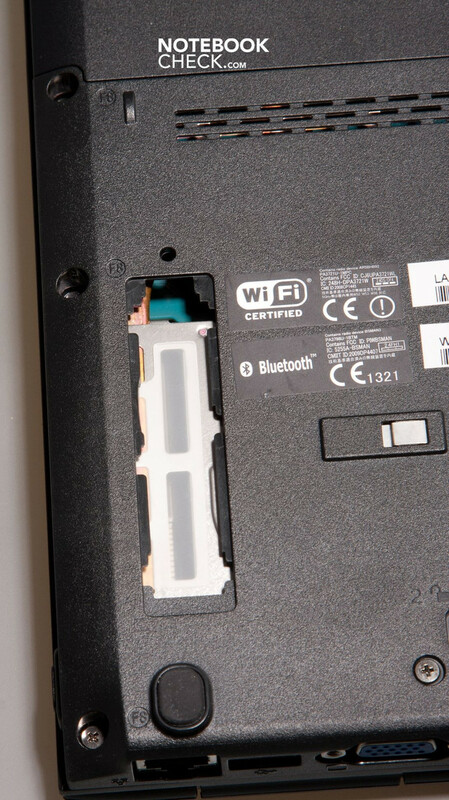 For even more security, there is a fingerprint sensor and splash water proof keyboard, aside a TPM module. Apart from the aforementioned mini display port adapters and the docking station, the list of supplies also include a car charger, an additional battery with the same capacity, RAM extensions and various notebook cases. The lack of a removeable multi-functional bay is disappointing. It would allow the use of a second hard disk or second battery instead of the optical drive. The latter would be sensible for a longer battery life, because there is no larger battery optionally available. 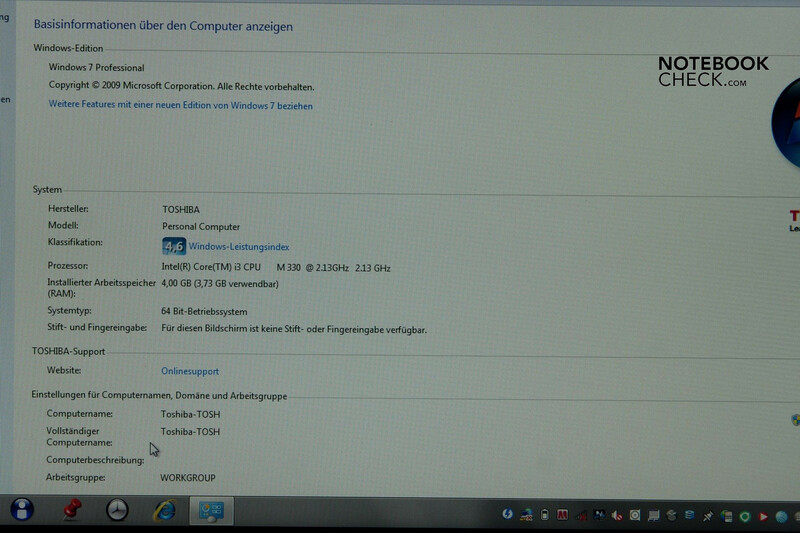 Windows 7 Professional in the 64 bit version is installed on the Tecra M11. The included recovery DVD is, however, Windows XP (downgrade?). 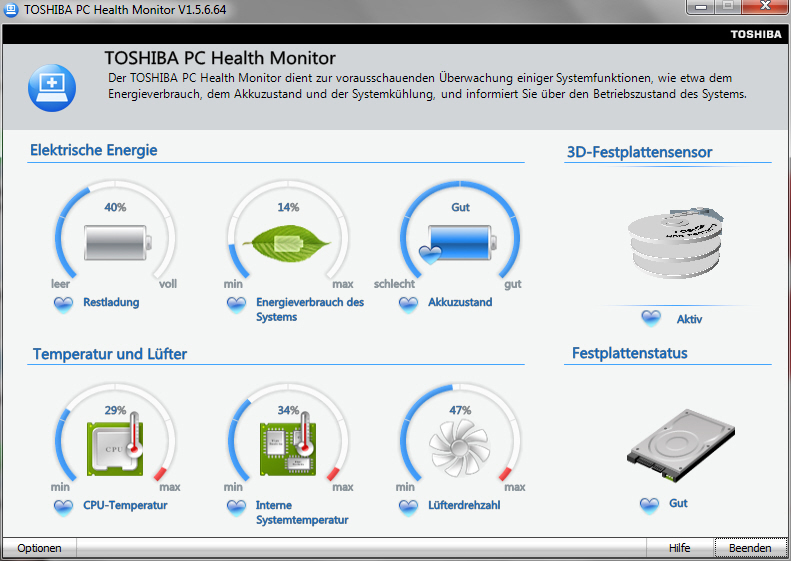 Toshiba has stuffed the Windows 7 installation with a load of more or less useful tools - almost 25! 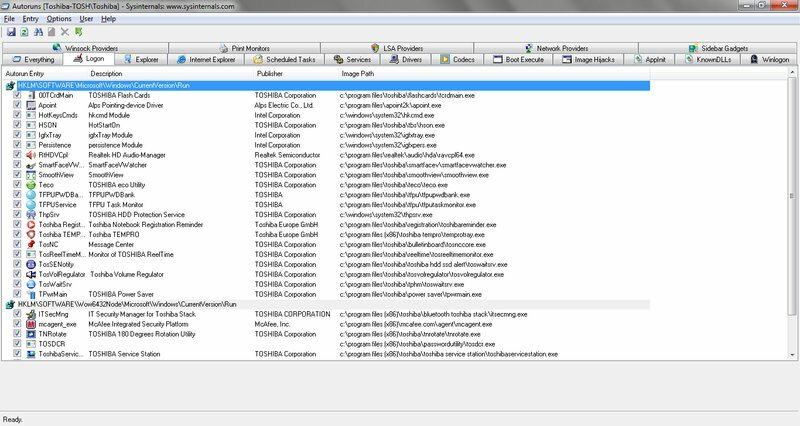 Programs start automatically when the computer is booted and attract negative attention with set up assistants, activation information or even crashes (Eco Tool). The warranty extension with or without onsite service or "no matter what happens" option is available in various price categories. 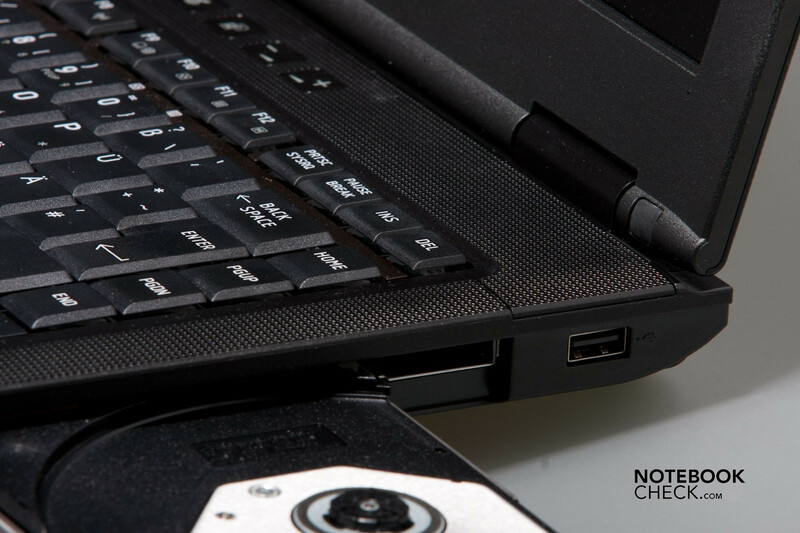 The "no matter what happens" service includes a replacement notebook in case of theft, or data recovery in case of damage and is thus a sensible option for mobile persons. The 87 keys on the black, splash proof keyboard are big enough to grant prolific typists pleasant typing. Merely the enter key has turned out a bit too small and evokes typos on the directly adjacent "Home", "Page up/down" or "End" keys. This can be annoying sometimes. 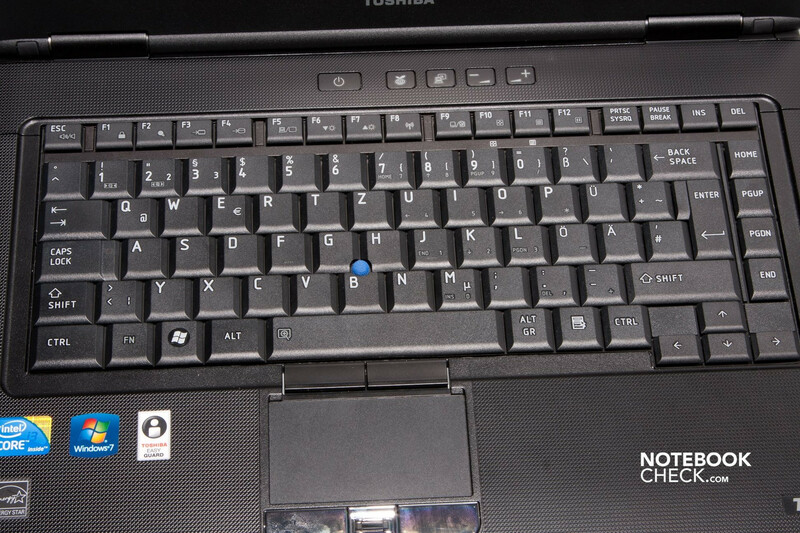 Both the keyboard's pressure point and stroke length are very clear and can well be compared to the Thinkpad L412's keyboard. 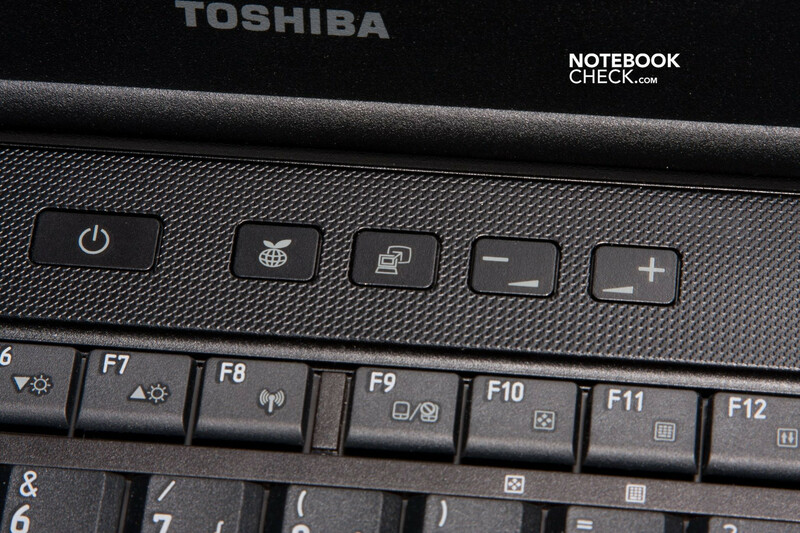 Toshiba loses rating points in the keyboard's choice of material and workmanship. The Tecra keyboard makes a somewhat clattery impression. Particularly because you can see under the M11's keys in almost every working angle. Thus, you have to take care that no crumbs fall between the keys. The low contrast of the key's lettering makes it difficult to type in poor lighting conditions. This is even more extreme for the M11's secondary keys. Each symbol only stands out diffidently from the black background. Whilst Lenovo has improved its trackpoint's ergonomics, in particular by enlarging the surface and more pleasant materials, the Accupoint reminds us of an early editions of IBM's joystick: small and hard with a unpleasantly rough surface. However, the precision and controllability is equivalent. The Accupoint has its own mouse keys that make a clattery impression, alike the keyboard. We also miss the center key, as is standard for Lenovo. However, which mouse replacement device is used, seems to generally be a question of faith. For this reason, the trackpoint isn't ever alone, but always comes with a touchpad as an alternative input device. It isn't too small and is comfortable to use in the M11. The mouse keys are made in a glossy chrome look, which doesn't quite match to the rest of the device's design. Moreover, they grime quickly. Every fingerprint is left on the keys. A third mouse key has also been left out here. The fingerprint sensor has been placed between both mouse keys instead. The notebook's alignment becomes obvious with the display. It's clearly intended for office work - due to LED technology it's economical, anti-glare and homogeneously illuminated. The display isn't recommendable for multimedia applications anyway. It has a narrow color spectrum, strong deviations in color representation (red and blue line), a high black value and a low viewing angle stability Why Toshiba has used a widescreen display with a low resolution (1366x768 pixels) in an office device is incomprehensible. Firstly, documents are usually worked on in an upright position and secondly, the resolution is too low for displaying two pages side by side. The display's maximum opening angle is 180 degrees. 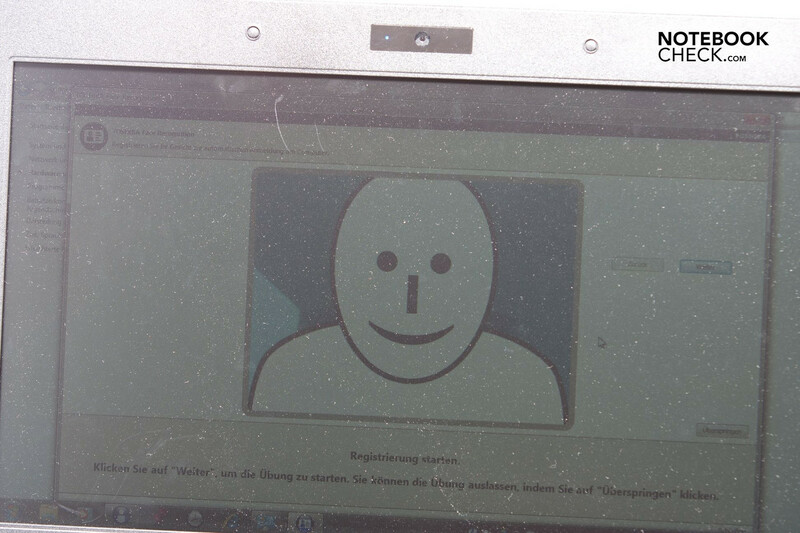 The user can sit in front of the notebook in almost every position. The tight hinges also add a further plus point to ergonomics by preventing the display from teetering intensely. Outdoor use shouldn't be a problem because of the anti-glare screen. Unfortunately, the display's brightness doesn't cooperate. The luminosity is even not enough in maximum (203 cd/m2). If you want to use the notebook outdoors anyway, you should look for an especially shady place. Besides that, the notebook has to go back to the mains after 2 to 2.5 hours. The given horizontal viewing angle stability proves to be more generous with possible viewing angles. The usual color changes have to be reckoned with even at the slightest deviation from the ideal viewing angle on the vertical plane. In comparison to the L412, the M11 scores significantly better. It achieves ca. 400 points more in 3DMark06. The Tecra is also superior by 100 points in the productivity benchmark, PCMark Vantage. And that despite an identical CPU and GPU. The reason for this could be the M11's twice as large RAM, which is also beneficial for the graphics card. 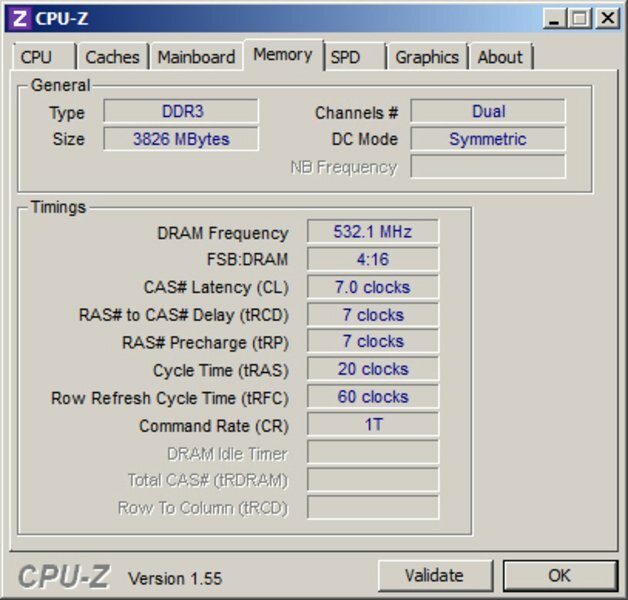 Latency Checker doesn't show any irregularities during real-time data processing. 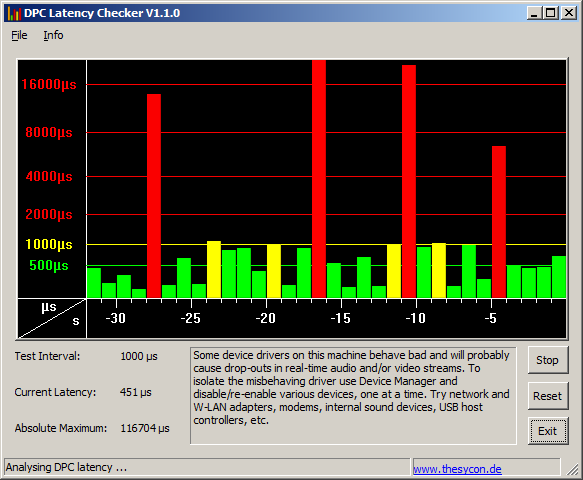 Occasional latencies only turn up during data processing with enabled WLAN. They usually remain unnoticed in office routine, though. Gaming performance is non-exixtent. 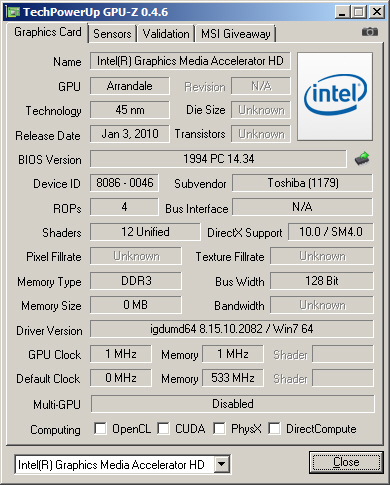 The integrated HD graphics only bids sufficient support for HD contents. There is no Blu-Ray drive and wouldn't be suitable for the intended application field, either. 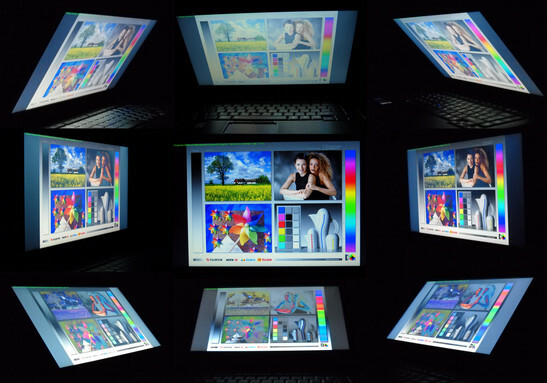 The HD graphics can render up to 2048x1536 pixels via display port. Thus, it's also suitable for HD laptop projectors. 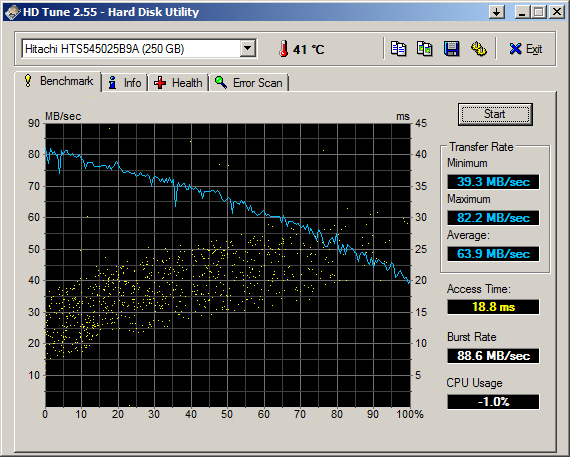 The used hard disk (5400 rpm) serves its purpose satisfactorily. Both transfer rates, as well as access rates are within the usual range of notebook hard disks. More hard disk memory is only available as USB/eSATA option or in larger M11 models (320 GB). 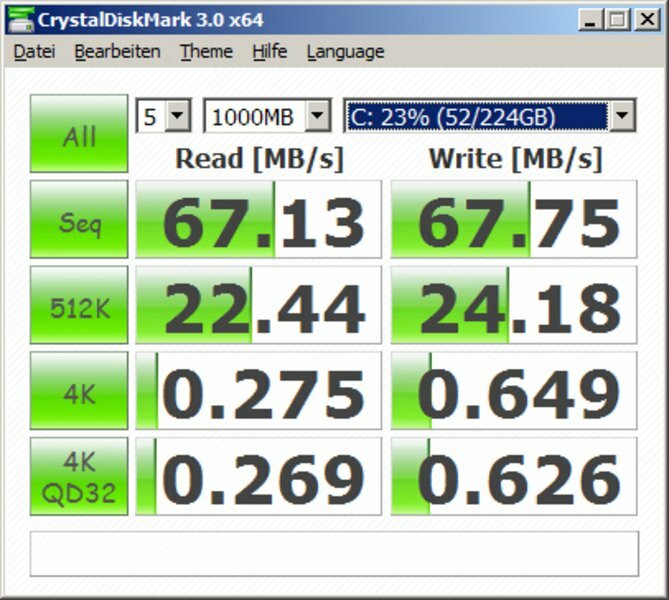 The use of an SSD, instead of hard disk, could improve the processing speed. But this option is regrettably not available and would have to be implemented by the user himself. How much sense the use of a double layer DVD burner makes is a matter of opinion. DL media is currently still unsuitable for data backup. Both the device's burning quality as well as the durability of media is very unreliable. Thus, it's recommendable to use an external drive for data backup. The Tecra stays within the expected rates in terms of system noise. It's hardly audible in office routine (30.8 dB). The initial drive noise (35.8 dB) also sinks to this rate after a short time. Depending on the additional load, the fan increases its speed in several steps and achieves 41.4 dB(A) under full load. That creates a considerable soundscape. The adapter can also get noisy. It emits a high-pitched whistling noise when under low load. 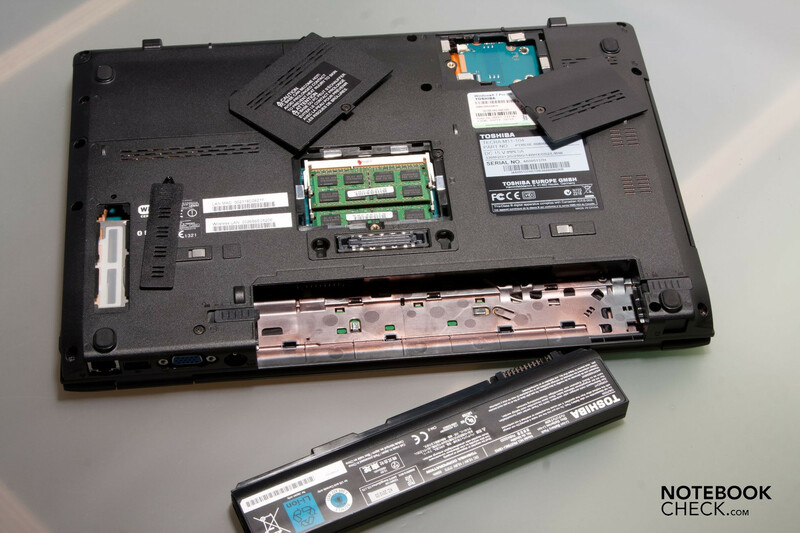 This noise wasn't heard when the battery was being charged or when the notebook needed a higher amount of power. The temperatures are still good in use under low load: 25°C up to a maximum of 30°C on the bottom and 29°C on the upper side. Especially the touchpad's vicinity gets very warm under load with 35°C. The peak value is 38°C above the vent in the upper left. The case's right remains cool with about 25°C, though. This is continued on the bottom. Peak temperatures of 40°C (center) up to 42°C (vent) are reached here. That can be unpleasant when the notebook is on your lap. The other side of the case stays cool with 25°C. Thus, it's better to have a smooth work surface where the notebook can be placed so that the bottom is well ventilated, especially under load. In comparison, the L412 only has a slightly better rate. The bottom stays cool, but the keyboard area gets too hot under load with 41°C. (+) The average temperature for the upper side under maximal load is 30.3 °C / 87 F, compared to the average of 29.4 °C / 85 F for the devices in the class Office. (+) The maximum temperature on the upper side is 38.1 °C / 101 F, compared to the average of 33.9 °C / 93 F, ranging from 21.2 to 62.5 °C for the class Office. (-) The average temperature of the palmrest area of similar devices was 28.2 °C / 82.8 F (-7.4 °C / -13.3 F). The Tecra M11 appears to be equipped for extensive collaboration scenarios with the HD webcam and integrated microphone. However, all fun of a video conference is quickly spoilt when a distorted voice comes out of the M11's little, electronic loudspeakers. The loudspeaker's placement on the beveled front has also been chosen unfavorably. Either the dialog partner will babble his comments into the user's lap, or the user's forearms will block the sound emission. There are no deep pitches or midranges whatsoever. As soon as the volume exceeds a certain level, the sounds rattle in your ears. 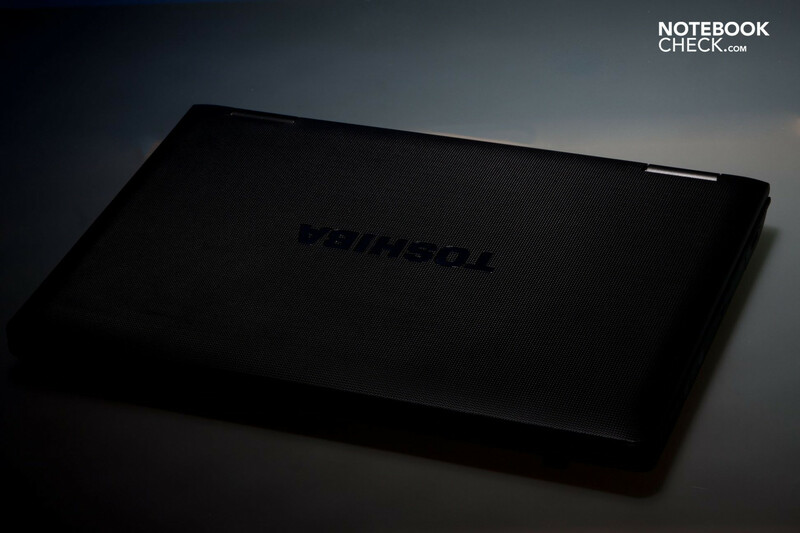 The notebook lasts for 5 hours and 30 minutes with the lowest display brightness and without load - a good time. This battery life isn't sufficient for a whole workday, though. Moreover, the low brightness stresses the eyes in a high degree. So it's better to have a spare battery in your bag. A longer movie can also be watched without ado with a DVD play time of almost two and a half hours. When WLAN is extensively loaded and you surf on various internet sites, the runtime only increases by about 10 minutes in comparison to DVD playing. The Tecra consumes quite a lot of power under load with 58 watts. Thus, the battery capacity is just one hour and 12 minutes. It's too bad that there aren't any larger batteries available. Lenovo can score here, as its optional 9 cell battery can significantly increase the otherwise identical battery life. Mobile business professionals could also find optional external battery solutions with particularly high capacities in HP's higher quality Thinkpad or Elitebook ranges', or in their removeable bay. The Tecra M11's application field is clearly defined. The components have basically been selected adequately for this scenario. Nevertheless, there are a few drawbacks found in details, which we wouldn't have expected of Toshiba's business platform. Starting with the display format, over the keyboard's manufacturing, the screeching loudspeakers, up to the non-existent cardreader cover. Moreover, we miss important supplies, like an ultrabay with configuration options. We also missed vPro range features that include advantages for the asset management, especially for larger companies. 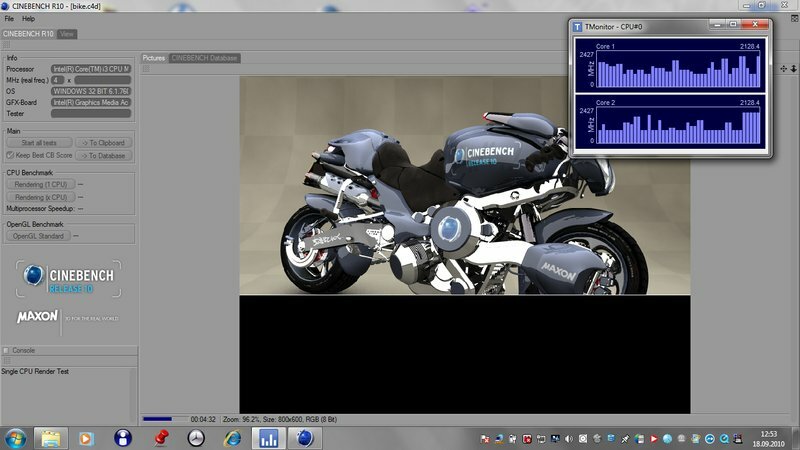 The compting performance of the notebook is solid, even if not overwhelming. The same applies to the battery life and emission rates. Regrettably, Toshiba can only keep its advertising promise for the Tecra M11-104 to an extent. Details in the configuration have only been inadequately implemented in many places - despite the numerous, promising approaches. Thus, the recommended retail price of 999€, as well as the current street price of about 850€ appears too high in our opinion. There are significantly more powerful office notebooks available for this price with more interfaces and superior upgrade possibilities. Even the available service options for the Tecra M11 are all liable for surcharge. Merely the case's stability and docking station port are left as arguments. But even they can't vindicate the price. The business notebook market is highly competitive. Various scenarios allow an absolute vast model and configuration diversity to emerge The manufacturer's have to stand out with individual innovations by frequently identical hardware components and thereof resulting identical processing performance. These are often copied in the battle of features, but usually only inadequately implemented. Regrettably. Full auto start in the Windows installation. You won't see the keyboard in low light. Clearly visible diamond pattern in the display. Poorly visible status LEDs on the front. You can look under the keyboard here, too. Small "Enter" key and large gaps on the keyboard. Handy: a cleanable air filter. Two slots for up to 8GB of RAM. ... adds up to a full task bar. The basically solid case. The bright, anti-glare display. Additional options, like bigger batteries or an ultrabay. UMTS is only available in the larger models and not optional. There is only a Windows XP recovery DVD included with the notebook. But Windows 7 is installed. 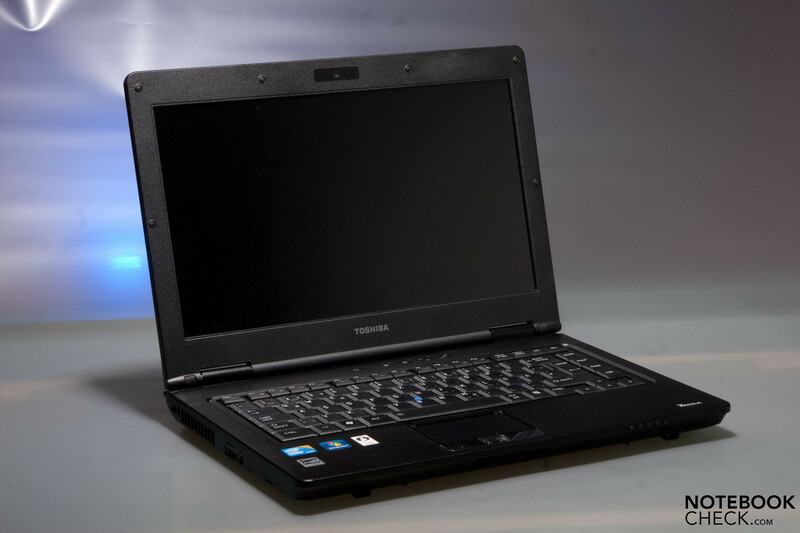 In comparison, Lenovo's Thinkpads offer a similar but fully developed features. For example, the L412 is almost identical in performance, but makes a more balanced impression and is pleasing with its excellent workmanship. The Fujitsu S760 mingles in the same market division and offers vPro support and circumferential options, amongst other things. But it's weak in terms of case stability. So you won't have a choice, but to consider the exact application scenarios before you set about choosing a notebook. The motto here is: The purpose justifies the means. Norman Pausch - Fotos: Revil O.